You're an Ace Operative, tasked with infiltrating and then destroying the base of operations of the Nefarious Nine Eye Army. You get in, you get out, and you set enough explosives to make the Great Tokyo Fireball look like a firecracker. You're tempted to just walk away, the flash will blind you and people a mile away, but ... you've got shades, and who doesn't want to look at their handiwork? Effectively, this trope is when a character brings destruction to a rather large structure and escapes, typically by the skin of their teeth, in time to manage to get a good view from above of the destruction taking place. Scenery Gorn tends to ensue. Expect a sillhouetted shot of the hero and/or Damsel in Distress as they engage in an After Action, Villain Analysis. For the inverse situation, where the hero has to watch a place he cares about go down in flames, see Watching Troy Burn. While both tend to involve looking down from a height at scenery, this is not to be confused with The World Is Just Awesome. Compare Collapsing Lair. Fullmetal Alchemist: Ed and Al invoke this trope by burning their home down so they won't be tempted to give up their quest to get their bodies back. Their father also offers an alternate explanation in the manga/Brotherhood version: it's the equivalent of a kid hiding their sheets after wetting the bed. They're not burning the house to sever their ties to home; they're burning it to destroy all traces of their failed experiment. In Code Geass Suzaku inadvertently fires the F. L. E. I. J. A. on Tokyo. He then laments on what he did and everything else he has done, when he walks in the crater he made. Patlabor The Movie's ending is on the ruins of a megastructure the protagonists tore down on a clear morning after the storm. A very pure use of this trope. The former page quote refers to a scene at the end of Battlefield Earth where we are treated to a scene of essentially shell-shocked cavemen staring at the ruins of the (not dome-shaped) dome that had been the base of the bad guys. The title character does this to the villain's home at the end of Django Unchained. Star Trek III: The Search for Spock. Played for Tear Jerker affect when the crew of Enterprise watch their starship burning up in the atmosphere after having beamed down to the planet's surface after activating the Self-Destruct Mechanism. Kirk: My God, Bones, what have I done? McCoy: What you had to do. What you always do... turn death into a fighting chance to live. Defied in the Biblical book of Jonah: After delivering his message to the Ninevites that God intends to destroy Ninevah, he climbs a cliff outside the city to watch it happen. There's nothing to see, however, because the point of his mission was to warn the Ninevites to change their ways and pray for another chance... which they've done. Zelda and Link watch Ganon's castle collapse into a heap at the end of The Legend of Zelda: Ocarina of Time, relieved that it's finally over. Or so they think. In Shounen Kininden Tsumuji after Tsumuji and his friends escape the collapsing Demon Castle, they watch as it falls to the ground and destroys the Shadow Tower. The end of Fallout shows the Big Bad's Supervillain Lair getting nuked into oblivion from a (hopefully) safe distance. In Fallout 2 the Enclave's oil rig explodes as you sail off into the night. In Fallout 3, evil players can detonate the nuclear bomb in Megaton and watch the explosion from the penthouse of Tenpenny Tower. In the Broken Steel DLC, if you choose to nuke the Enclave Mobile Base, your getaway pilot lands a safe distance away to let you watch the bombs drop. In the backstory of Fallout: New Vegas: Lonesome Road, the Courier unwittingly destroyed the Divide by delivering a package of Lost Technology that caused the town's nukes to detonate in their silos. Halfway through the quest line, you have to launch another nuke to proceed, creating the "Courier's Mile". At the end of Fallout 4's main storyline, if siding against the Institute, you get to blow up their base while watching from the rooftops of Boston. Same goes with the Brotherhood of Steel's airship if you have sided with the Institute or Railroad, or made enemies with the BOS while allied with the Minutemen with all hands on board. Including children. 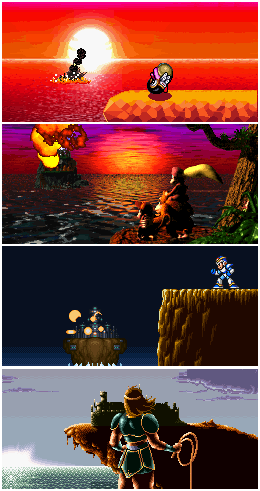 Ending of Donkey Kong Country 2: Diddy's Kong Quest has Diddy, Dixie and DK watching Crocodile Isle collapse into the ocean as the sun sets. Half-Life 2: Episode 2 begins with Gordon and Alyx overlooking the destruction of the Citadel they caused during Episode 1 and the end of Half-Life 2. The Human campaign of Warcraft II: Tides of Darkness ends with an unnamed mage (who is later revealed to be Khadgar) and a human army standing in a cliff above the pit which is home to the nefarious Dark Portal. His eyes go glowy, and a massive pillar of energy breaks through the surface of the ground and envelops the portal. Cue the "standing above the destruction, arms raised in triumph, while cool music plays" scene. The portal got better... then made babies. The ending of Iji plays with this. Iji is reunited with her brother on a cliff overlooking the blasted earth unless the player fails to save him, which leaves Iji kneeling on the cliff by herself, but then the camera angle reverses to show the Komato invasion fleet leaving orbit. Happens in a rather horrific manner in Mass Effect 3 if you can't create peace on Rannoch and the quarians get wiped out. You either get to see Tali or (if the former is already dead) Admiral Raan commit suicide, and then the rest of the scene is spent on a cliff watching the debris from the destroyed quarian flotilla fall down through the clouds, and knowing it's your fault. It's one of the most depressing scenes in the entire trilogy. The ending sequences for several characters in Street Fighter IV, feature Guile, Chun Li and Abel overlooking the still smoldering ruins of S.I.N. labs from a nearby cliff, after narrowly escaping alive. The NES Ninja Gaiden games were fond of this trope. In Ninja Gaiden II, the Evil Overlord's lair collapses bit by enormous bit. Inverted in The Lost Vikings. If you get a game over, the scene shows the surviving viking(s) on a random shore, taking a glace on a burning boat drifting away. Push the continue button, and the dead vikings will be revived then you can continue the game. The endings of many, many Castlevania games. Except more often than not, the castle is still crumbling as the Belmont-of-the-Day looks on from a distant cliff. This happened at the end of Skies of Arcadia, when the evil headquarters (an artificial island built during an ancient war) tumbles back into the swamp from which it was uncovered. The ending of Shinobi III, where Joe looks at the remains of Neo Zeed's aerial base from a cliff after it crashes into the ground. In an episode of the web fiction serial Legion of Nothing, the Grand Lake Heroes League visits the old lair located under the mansion of Red Lightning where the original Heroes League (the parents and grandparents of the current team) had to fight Red Lightning (a former good guy turned super-villain) in an all-out battle that burned down everything inside the cave. The characters comment that all these years later the burn and scorch marks look brand new. In a slight twist to the trope, the first part of the season finale of the web fiction serial Dimension Heroes shows the Big Bad and his henchmen watching the destruction of the city they helped bring about with smug satisfaction. In Avatar: The Last Airbender, Aang gets a moment of this atop a stack rock formation after defeating Ozai. He uses it to pull the ocean inland to put out the fire in the forest below. A day will come when sacred Troy shall perish, and Priam and his people shall be slain. - Scipio Aemilianus Africanus at the ruins of Carthage invoking this trope. It is almost certain that he was using Troy as a Roman à Clef for Rome itself.